Money impacts almost every aspect of our lives either directly or indirectly. Therefore, the need to make money on a consistent basis is one we all must address. For those more established this may come fairly easily, but what if you are feeling lost with where you are or just starting on your journey toward financial independence? Learning how to make money in a way that leads to full financial independence takes shape in three steps: employment, sidehustles, and starting a business. No matter where you are in life there is one surefire money making scheme guaranteed to increase your bottom line, a job. It may not be glamorous or even enjoyable, but before we take any steps toward financial independce we need to have financial stability. Wealth is what we are all striving to achieve, but in order to build wealth we have to first make sure we are avoiding poverty. The Brookings institute did a study of how to not be poor. They found that in order for someone to never experience long term poverty they had to do three things. The first was to graduate high school. Multiple job opportunities open up to anyone who has a high school diploma. If you do not have one you can always look into getting a GED. Second was to not get married until you are 21 and to not have children until you get married. Single parents, and especially those who become parents early in life, have the highest rate of poverty in the United States. Finally get a job. Any job, even a part-time job.. The most important part of this is that you stick to it. Don’t quit right when you dislike a job and make sure you show up on time. Be the employee you would want if you were running the business. Over time your efforts will pay off and you will get promoted, or someone else will notice and hire you to do a better job. The key is to keep working hard. Doing this will help you move up the income ladder and help you with the next step. A side hustle is a way to make money on the side while you work your full time job. They can be simple or complex, but the key to understanding them is that they are there to supplement your income to help you take your next financial step faster. These steps could include paying off your debt faster, building up an emergency fund, or increasing your retirement savings. Side hustles are usually short term ventures, but if your ideas are good enough and your hustle hard enough they can turn into something much larger. As you check out side hustle ideas, always keep in mind that they have the potential to lead to a much larger financial goal. Becoming an entrepreneur can be one of the most fulfilling and challenging decisions anyone can make. Small business owners are the engine that powers our economy and helps create jobs at all levels of the income scale. That being said, if you are looking to start your own business, I recommend finding a way to make money at something you are passionate about. This is why so many entrepreneurs start out with a side hustle and grow it into a larger business. Reduce Risk – I know several people who risked it all and hit it big with their own business. I also know people who have fallen flat and almost lost everything. Starting a little slower can help you reduce that risk. Prevent Debt – Debt can be a killer if not managed properly. This is especially true in business. If you can cash flow your investments early on then you can steer clear of debt until you have a real plan for how to leverage it. Make sure you like it – Business ownership is a grind and it isn’t for everyone. You may get six months in and decide it isn’t for you. By starting a little smaller you can get your feet wet and know exactly whether this is the right move for you and your family. If you still feel you have a home run idea, just make sure you are asking yourself the right questions and being honest about how quickly that business is going to grow. If you are looking to make more money, but don’t have an idea of where to start, here are some great ideas to keep you going. With sites like SurveyJunkie you can get paid for participating in market research. The surveys are quick, pay decently well when you think of them on a per hour basis, and you can sign up for more than one of these legit online survey sites. You can easily make $50 a month doing surveys from these sites. There are sites that will actually pay you for doing your regular searches through their platform. The Most famous is Swagbucks. Swagbucks has expanded into other areas and will even pay you to play video games. Even kids can make money with these programs allowing people as young as 13 to join. You can actually earn cash back for your shopping. Services like TopCashBack will pay you a rebate for your purchases that you make by visiting their site before you head to your favorite online stores (Amazon, Walmart, HomeDepot, etc). With the best cash back rebate sites I frequently get anywhere from 2-20% cash back on my purchases. You can get signed up with Uber in less than two weeks if you meet the qualifications. Once there, driving for Uber can turn into a significant side income. Similar to the rideshare gig, you can also work as a delivery driver. This gives you the ability to use your vehicle to make money and not have to deal with strangers in your car. A great place to start is Door Dash or sign up to deliver pizza. My wife has been doing mystery shopping for several years now. We have been able to score extra cash as well as get free groceries, free meals at restaurants, and oil changes. With most of those items we were able to get something free and get paid. You can donate blood and usually get a set of movie tickets or a small gift card. However, if you donate plasma for money you can make a lot more and donate on a more frequent basis. There are always tried and true ways to make some money. These three are a great start. Sell Some Stuff – Whenever anyone is in a pinch, selling some clothes or other items can make you some quick cash. Get a Job – Employment is one of the few guaranteed money making schemes. If you already have a job then maybe a second job you do in some of your spare time is a way to make some money for a specific goal you are trying to achieve. Freelance Your Skills – Freelancing is a great first step to entrepreneurship. If you have skills that you can use outside your regular employment, then get a side hustle rolling as a freelancer. Move – If you are having problems finding employment where you are, cast a wider net and be willing to move. There are even some places that will pay you to live there, but be warned, they are usually somewhere that is having problems getting people to stay in their jurisdiction. 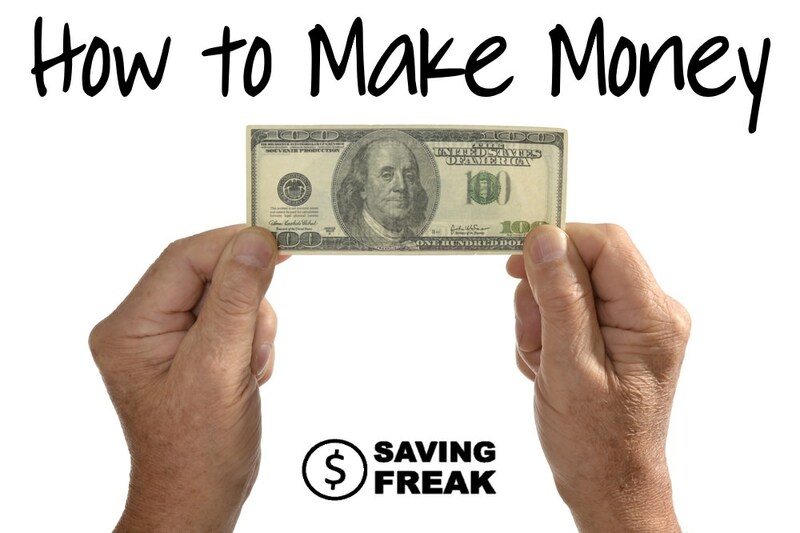 Saving vs Making Money – Which is Better? Making money can be fun, but ultimately spending money is the real fun part. However, if we want to accomplish financial independence then making money is just one part of the equation. The other is saving money. As to the answer to the which is better question, the answer is neither is better, but they are are both great when you use them together. Imagine being in a situation where you cut your spending by $200 a month and then find a way to make an extra $200 a month. Each of these may be small goals, but you can now throw an extra $400 dollars per month at one of your debts. If that works into your debt snowball, you could be looking at being debt free years earlier. So instead of focusing on whether you should spend less or make more money, focus on maximizing your efforts on both the income and out go in your budget. The reasons you come up with will result in goals you set for yourself. Goals are what is going to allow you to push through the hard work it takes to get your finances in order and then to be successful. So why are you doing this and where do you want to be in one year, five years, 10 years? Answer those four questions and not only can you start to make money, but you can maximize that money.